A fine Havana cigar has long been one of the major joys Cuba offers visitors. Nevertheless, tourists and businessman lighting up Monday morning during breakfast at the five-star Hotel Nacional were politely but firmly told by maitre d' Pedro Santos that smoking was no longer permitted on the premises. Santos was implementing new regulations that ban smoking in most public places, including offices, shops, taxis and buses. Indoor restaurants are obligated to set aside a special smoking section. Smoking has long been forbidden in schools and hospitals. "We've removed all the ashtrays but haven't gotten the no-smoking signs up yet," Santos said. While the hotel guests stubbed out their smokes without grumbling, Cuban smokers are seething about the new regulations. "What are they going to take away next," asked 23-year old film student Daniel Gonzalez, as he and a couple of friends lit up. "Its one of the few things we can do and it's cheap." That's just what worries health authorities. Government statistics show that approximately one third of the population smokes. Lung cancer (80 percent of which Cuban doctors link to smoking) is a major killer. Cancer is now the second leading cause of death in Cuba. The new regulations prohibit the sale of cigarettes to those 16 and under and all stores located within 100 meters of schools or health care installations have removed cigarettes from their shelves. While the famed Havana cigars carry a hefty price tag, smoking is so much a part of the local culture that the government underwrites its costs. Cubans buy their beloved black tobacco cigarettes for two Cuban pesos, or less than 10 cents U.S. a pack, at the same time as they pick up their groceries. Both are included among the basic rations guaranteed monthly by the State. Four years ago, a World Health Organization survey of smoking in Cuba revealed that nearly one of every three 12 to 14 year old had experimented with tobacco. Alarmed by such statistics, the Ministry of Commerce ruled that anyone born after 1955 was ineligible for subsidized cigarettes. That measure hasn't done much to curb the trend. Even cigarettes off the ration are cheap compared to prices in other countries. Export quality filter tips like the Populares brand go for as little only 60 U.S. cents and even well known brands such as Romeo y Julieta or H. Upmann are a bargain at just $1.50 a pack. "Raising the price or slapping up a 'no-smoking sign' is not going to stop me," declared mechanic Joel Garcia, 27, as he bought a pack of non-filter Populares at a fast food stand. "You have to want to quit and I don't." Nidia Cuevas, a diehard smoker who works for an auditing firm, says smoking has been prohibited in many offices for a long time already. "When I was checking the books at Cubanacan [a Cuban tourism corporation] I had to step out on a terrace to light up. You can't smoke in the offices, not even in the lunchroom." Doctors or nurses caught smoking by hygiene and epidemiology inspectors at the Jose Ramon Portuondo policlinic in Havana have been fined, as have workers at Cuban Radio and Television. "They can fine you up to 90 pesos if you get caught," said Raul Blanco, a tape editor. No official announcement has been made as to just how authorities expect to enforce the new smoking ban. Tolerance for smoking has waned slowly but the government is now waging an all-out public service campaign against the habit. Health warnings have long been printed on cigarette packaging but those messages are now in large print. Billboards and signs advertising cigarettes have been taken down and normally ad-free Cuban TV programming is now running a series of anti-smoking commercials. These ads target teens and parents, in particular. 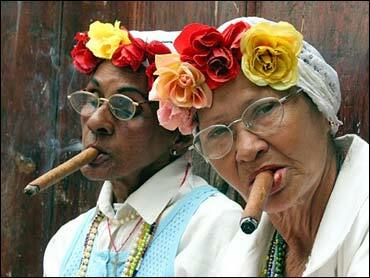 Whether Cuba will cease to be a smoker's paradise remains to be seen. (The island earns $200 million annually from cigar exports.) In the meantime, an organizer of the annual Habanos Cigar Festival, slated to begin Feb. 21, says they are negotiating a waiver of the smoking ban for the venue of the event. "It's a delicate issue and we don't want to make any announcements," he said, asking not to be identified. The Festival's grand finale is an auction of hand carved humidors and select cigars. Over the past six years, the auctions have raised more than $4 million U.S. and donated it all to the public health system.